If you are planning a trip to Disney World then you are probably also wondering what to pack for Disney World. 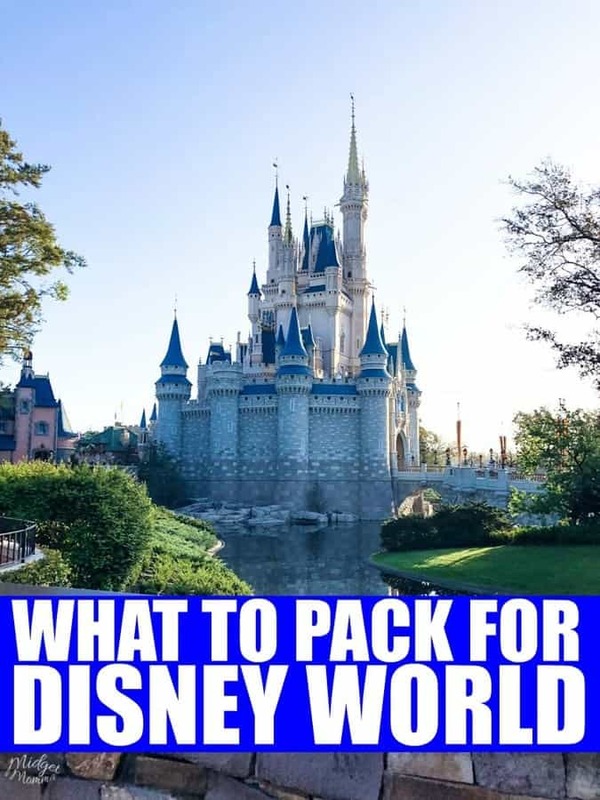 I promise you it is really easy to pack for Disney World and this Disney World Packing list will make your life so much easier. 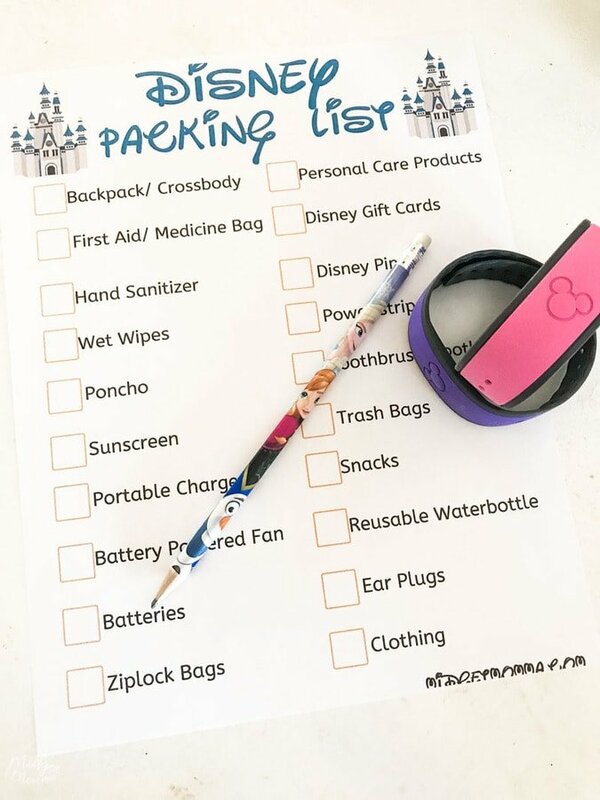 There is also a Disney World Packing List printable, that you can print to check off as you work thru the list of things to pack for Disney World. When you’re packing for a Walt Disney World trip, there’s a fine balance between bringing what you need and packing the kitchen sink. If you want to make the most of your time and save money, taking along just the right items will keep you from running around the park on a search and also keep your budget in check. Having everything you need ahead of time will also help you get on the most rides at Disney World, and see the most attractions that you can! Items in theme parks often come with a premium price, but if it’s something you NEED, you’ll have to shell out the money for it. We’re going to give you a master list of the best and most practical items to bring on your next trip. If you pack more than just the bare necessities, you’ll have your family thinking you’re practically perfect in every way! You will notice that our list doesn’t have a camera on it. We love the Disney World Memory Maker, it makes getting family photos so much easier! Plus you can not skip the extra magic that you can get with Disney World Memory Maker photos! Not sure about the Disney World Memory maker? Learn all about it here. To make your life easier, when you are getting your packing done for your Disney Trip we have also created a Disney Packing List Printable. Just click here and print it. I like taking a slim backpack if I’m traveling with kids or a crossbody if I’m not. Both, of course, come in handy for stowing your park necessities. They also fit conveniently on most rides and attractions. I prefer the slim backpacks so you don’t bump into others or cut into their space while standing in line. If you are wanting to keep everything in the Disney theme, ShopDisney often has them on sale! I have used an old canvas makeup bag for OTC medicines for years. It’s so handy and I’ve even taken to leaving it in my car when we aren’t traveling. I typically keep: pain reliever pills and chewables for kids, allergy medicine, Tums, Pepto Bismol, and cough drops. First Aid wise, I have various sizes of bandages, Neosporin, antiseptic wipes, and antihistamine cream. I also throw aloe vera, chapstick, and Kleenex in there too. If you’re snacking in the park, you might not want to run to the bathroom to wash your hands before every snack. That’s where the hand sanitizer comes in handy. Wet Wipes are good for wiping down airplane trays, tables at the parks, and any other surface you might look at and think “Yuck!”. I also carry baby wipes with me as well for easy cleaning of sticky hands, that come from those tasty Mickey Ice cream treats! Disney is known for small, quick rain showers (which will not ruin your day, but be sure to check out our post on How to do Disney World in the rain). The good thing is that they pass quickly, but they can be heavy and leave you soaked. In the parks, you can find Disney ponchos for about $9 a piece. A better idea is to plan ahead and hit up the dollar store and bring your own, check out everything that we love scoring to bring with us to Disney World at the Dollar store! You will be surprised by how tanned you can get from a day in the parks. The cost of a bottle in the parks and resorts is well above the regular price. Save yourself some money and a sunburn and bring your sunscreen with you. There are outlets scattered throughout the park but it’s quick and convenient to have a backup just in case. If you have a small child that will be in a stroller, these things are a lifesaver. Clip it to the side and let the baby relax with a breeze. They do sell a sprayer with a fan in the parks, but they will run you about $25-$40 depending on the one you want. But if you have a kid who would beg you for one, grab one from ebay or ShopDisney before you leave for your trip. They are much cheaper that way. These are good for keeping cell phones and wallets dry on water rides. I like to grab Disney Ziploc bags on Amazon, so our bags are in the theme of our trip. However you can totally use the plain ones if you want to. If you’re staying at a hotel or resort, you may have rowdy neighbors. There’s not much you can do about it but popping some ear plugs in can help you get some sleep. Bottled water is pricey in the parks, about $3 a bottle. Bring your own and ask for ice and water at kiosks and stands that serve fountain drinks to fill up your own bottles. Ice and water are free! I personally like to grab Disney Water bottles from ShopDisney so everyone can have a water that is easy to spot as their own. Plus ShopDisney often has sales, so you can score them on the cheap too! While is is a for sure thing that you are going to be enjoying Disney World park food because there is so much that is super tasty, having snacks with you in the park and in the hotel room can be a big help. We always have snacks with us, because we have had many times where a kiddo will say they are hungry late at night or while we are waiting in line for a ride. If you are looking to save money on your dining in Disney World, be sure to check out our Cheap Eats at Disney post! You might also want to pack some fun items that can save money at the parks. It’s fun to shop for souvenirs but it can add up quick. Do some shopping at the dollar store or even Target and Walmart and tuck the items away for when the kids ask for any and everything at the parks! Disney Gift Cards! Check out our post on How to get Discount Disney Gift Cards! Disney Pins for trading. You will want to check ebay and Amazon for cheap pins, you will be able to get them for about 50¢ each. Since the kids are going to be trading them it is better to buy them on the cheap then paying $5-$8 per pin in the parks. Glow Sticks– when the sun goes down, all the pricey lighted items come out. Disney T-shirts. Shirts are much cheaper outside of the parks, much cheaper! Be sure to check out our post on how to get cheap Disney Shirts. Be sure to check out how to get Disney Shirts cheap, for where I save the most money when buying shirts for our Disney trips. Pennies and Quarters. These come in handy for wishing fountains and the many penny press machines that you will find in Disney World. Disney World Autograph Book. I highly suggest checking ebay and ShopDisney for these before your trip. You will be able to get them much cheaper then buying them in the park. We know with these tips, you’ll be ready for the best visit to the House of Mouse! Be sure to check out all of our other Disney World vacation planning posts, to help you make the most of your Disney World trip! Disney Military Discount – All the Discount Military Members can get from Disney Tickets, Hotel and more! Best Disney Hotels for Families – Going to Disney with the family? Check out these resorts that are perfect for families going to Disney world. How to Ride More Rides at Disney World – Want to ride the most rides while at Disney? Be sure you check out these tips! Weeklong Disney World Vacation Tips – Making your Disney World Trip a week long adventure? Be sure to check out these Disney vacation planning tips! Disney free stuff – Everything you can score for free at Disney World – and so many of them are AWESOME! Tips for Doing Disney World in the Rain! Don’t let a little rain get in the way of your fun! You can still have an amazing time even when it is raining at Disney World!